By BAJA Writer Joanie Cox-Henry. Originally published in the Fall 2018 issue of Art Hive Magazine. 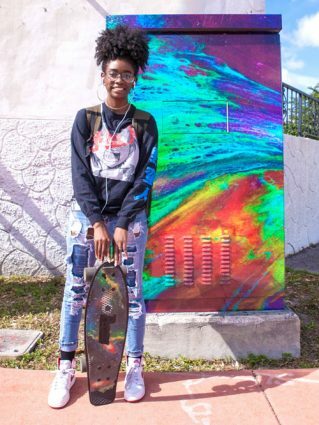 It’s not every day you see an artist cruising a skateboard passed the artwork they created, but for 20-year-old Ruth Burotte, the streets of Broward County have become her canvas. 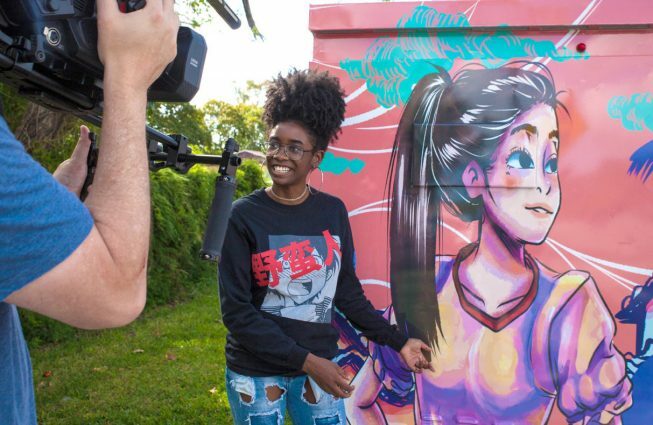 As the youngest artist to ever receive a commission from the Bro­ward Public Art & Design program, Burotte uniquely wrapped eight traffic signal cabinets in the Broward Municipal Services District (BMSD) with her custom designs. The cabinets had previously been cluttered with graffiti and unsightly posters. Now, each cabinet fea­tures a colorful portrayal that reflects the surrounding community. Blocks from MLK Elementary School, the formerly mundane box now proudly represents the school’s namesake. “I felt pretty honored that I was the youngest to ever get a commission. 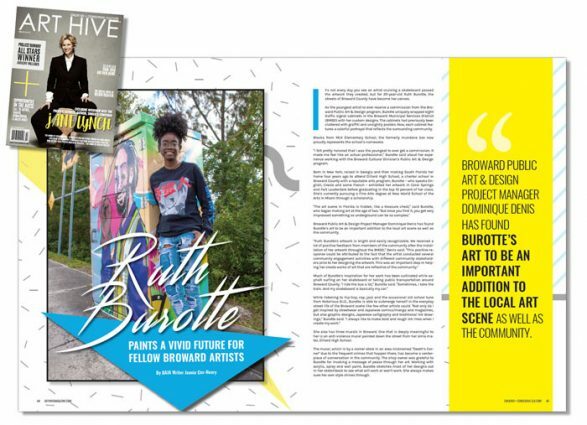 It made me feel like an actual professional,” Burotte said about her expe­rience working with the Broward Cultural Division’s Public Art & Design program. Born in New York, raised in Georgia and then making South Florida her home four years ago to attend Dillard High School, a charter school in Broward County with a reputable arts program, Burotte – who speaks En­glish, Creole and some French – exhibited her artwork in Coral Springs and Fort Lauderdale before graduating in the top 10 percent of her class. She’s currently pursuing a Fine Arts degree at New World School of the Arts in Miami through a scholarship. 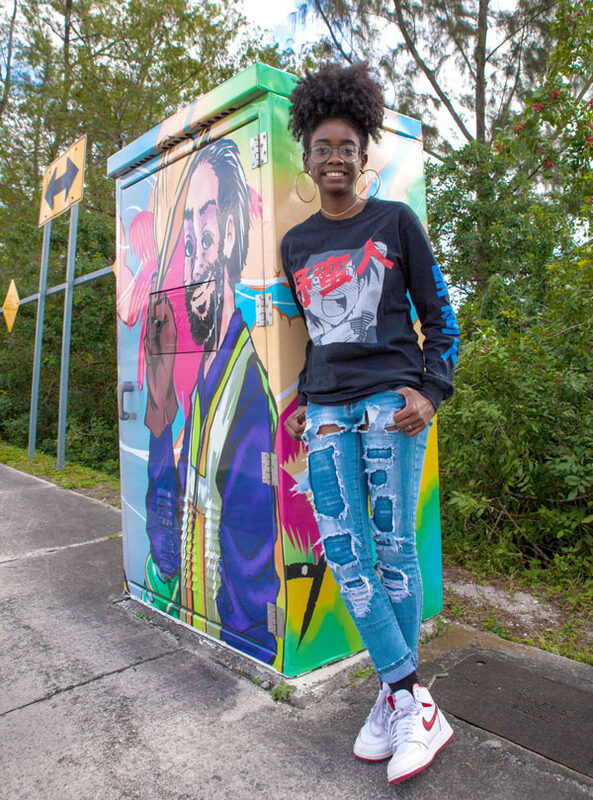 Broward Public Art & Design Project Manager Dominique Denis has found Burotte’s art to be an important addition to the local art scene as well as the community. She also has three murals in Broward. One that is deeply meaningful to her is an anti-violence mural painted down the street from her alma ma­ter, Dillard High School. The mural, which is by a corner store in an area nicknamed “Death’s Cor­ner” due to the frequent crimes that happen there, has become a center­piece of conversation in the community. The shop owner was grateful to Burotte for invoking a message of peace through her art. Working with acrylic, spray and wall paint, Burotte sketches most of her designs out in her sketchbook to see what will work or won’t work. She always makes sure her own style shines through. One of the highlights of Burotte’s flourishing career happened recently when she was flown to Europe in June to work with one of her favorite brands, Adidas. During her time in Europe, Burotte was thrilled to get a taste of the art scene there and snap a selfie with Grammy Award-winning producer Pharrell Williams, who has a shoe line with Adidas. Burotte was also surprised to see how many Broward youths now have an interest in art because of her work. “For other artists out there, who want to get more ex­perience, find out about all the ‘call to artists’ hap­pening and submit your work. Find out, sign up and never look back. Go out into the community and ask if you can do murals. Be proactive in your community,” Burotte emphasized.